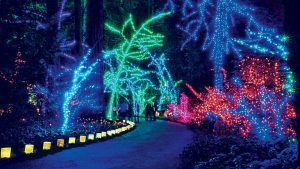 If you are looking for a spectacular display of Christmas Lights this holiday, then you and your family need to check out the Christmas Festival of Lights at The Grotto in Portland, OR. The Grotto is a Catholic shrine dedicated to Mary, mother of Jesus. The story behind The Grotto is that at the end of the 1800’s, a young boy learned that his mother was sick and near death. He prayed to God to save her life, and promised that if she lived, he would one day do incredible things in honor of him. That boy, who grew up to become Father Ambrose Mayer, never forgot his promise and purchased some run down land in North East Portland that was owned by the Union Pacific Railroad Company. Father Mayer’s vision was to create a monument where people of all faiths can seek peace and serenity. Since 1923, over 10 million people have visited its beautiful grounds. Each Christmas, the Grotto puts on a incredible display of Christmas lights. Our family visited and we were amazed by the size and scope of the display. If you are in Portland around the holidays, we recommend that you check it out, too.